A contaminant is defined as any foreign, undesirable physical, chemical, or biological substance in the environment, and includes anything from sawdust to nutrients, suspended solids, pesticides, and industrial chemicals. It has been estimated that 100-500 thousand chemicals are now in regular industrial use and most have the potential to enter the marine environment through a variety of sources. Beginning in the late 1700s, the rivers, estuaries and marine waters of the Gulf of Maine watershed were used to transport logs, harvest fish and power sawmills. As the population of the region increased and other industries developed, they were used as waste dumps for a wide range of activities including logging operations, sawmills, fish processing plants, private septic systems, municipal sewage plants, pulp mills, agricultural drainage and aquaculture operations. Growth in coastal populations around the Gulf of Maine, increased development, and changes in land use have all contributed towards increased contaminant levels in coastal waters in the region. There are about 2,024 active point sources of contaminants in the region, of which 378 are wastewater treatment plants and 93 are power plants. 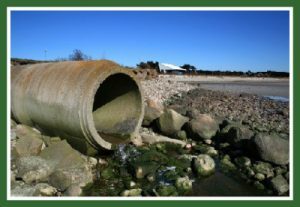 The Gulf of Maine Council on the Marine Environment has identified sewage, nutrients and mercury as the three contaminant problems of the greatest concern for the Gulf of Maine region (see in Tides of Change Across the Gulf). In addition, there is a concern that microbial pathogens (bacteria, viruses and protozoa) may cause human diseases from exposure to contaminated shellfish and water. Gulfwatch is a chemical contaminants monitoring program organized and administered by the Gulf of Maine Council. Since 1993, Gulfwatch has measured contaminants in blue mussels (Mytilus edulis) to assess the types and concentration of contaminants in coastal waters of the Gulf of Maine. It is one of the few monitoring programs and the only one in the Gulf of Maine to be coordinated across international borders. In addition to the Actions and Responses described in each theme paper, many different organizations have developed guidelines, codes of conduct, best management practices, or other types of advice aimed at addressing the issues described in the theme papers. Some of the guidelines related to Contaminants can be found here. These links are maintained by outside agencies and are provided for information purposes. The linked documents are not endorsed by the Gulf of Maine Council on the Marine Environment.